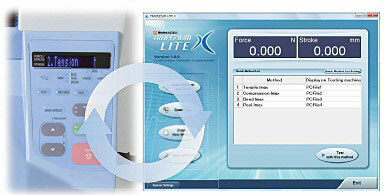 TRAPEZIUM LITE X is newly developed simple software for Autograph series testing machines. 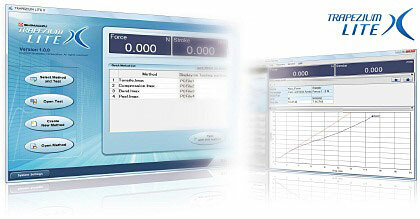 It boasts comprehensive new functions for more efficient testing. As the number of displayed buttons is restricted according to the login authority, the operator uses very simple screen displays for operations. To start a test, simply select the test methods from a list. 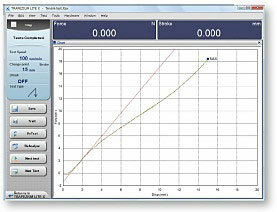 For a clearer display, just the required information can be selected for display during testing, such as the maximum size graph or the test results. Test method files for rubbers, plastics, and films that comply with JIS/ISO/ASTM standards are provided. The terminology and data processing items specified in the test standard are pre-registered in the respective test method file to permit smooth testing in compliance with the test standards. *The test method files supplied on the installation CD may not conform to the latest standards. Test results obtained using these test method files are not guaranteed. Register often-used test methods to the Quick Method List to start testing instantly. The registered test methods can be directly selected or edited at the AGS-X tester, making testing easy even for users who find using a PC troublesome. Just set up the test and start testing. All tedious operations have been automated. The sequence of operations frequently conducted after testing can be fully automated. Functions for coordinating with the AGS-X permit saving of test data and report generation and printing without touching a PC. Effectively utilize daily test results. 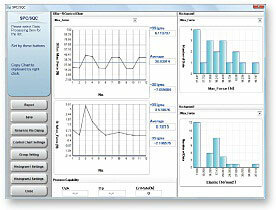 Test results can be extracted and complied over a fixed period to create histograms and XBar-R control charts. Statistics can be compiled on daily test results by date, by specimen, or by batch, and the statistical results displayed on screen. 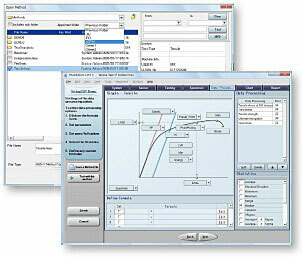 Text can be added to statistical information for printing or output to a pdf file.